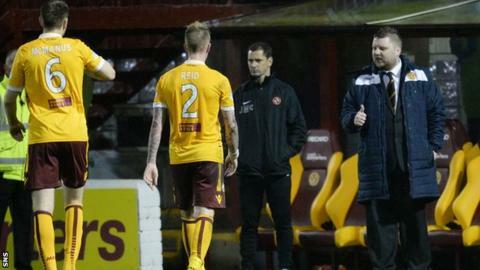 Motherwell general manager Alan Burrows (far right) congratulates the team after victory over Dundee United. Motherwell appear to be a club in a state of flux with their search for a new manager still ongoing and unresolved issues over their ownership. The Scottish Premiership outfit have, however, stepped up their hunt for a new boss following the departure of Stuart McCall at the start of November. And there is hope that the Fir Park club could soon be under new ownership. BBC Scotland's Brian McLauchlin has spoken to Motherwell's general manager Alan Burrows in an attempt to clear up some of the issues currently surrounding the Steelmen. What stage are Motherwell at in relation to appointing a permanent replacement for Stuart McCall? "We are in the middle of the interview process. We have spoken to one or two and we will continue to speak to a couple more over the next few days and we hope to be in a much clearer position by the middle of next week." Kenny Black (left) was assistant manager to Stuart McCall with the pairing leading Motherwell to two second place finishes. With the potential of new owners coming in, what active part are they playing in the search for a new manager? "The people involved have to be involved. That is why we put the new managers position on hold. We feel it would have been unfair on both a new manager and a new owner if this was not the case. But now we are approaching the final stages of the takeover we can now carry that on with the blessing of everyone involved." Is current caretaker boss Kenny Black under consideration? "We thought initially that Kenny was not interested in the position but Kenny and I had a conversation yesterday (Thursday) and he said that he was keen to be considered. So Kenny will be spoken too. I think we would be duty bound to do so particularly for all that he has done for this football club. Particularly in the past couple of weeks when he has held the reigns through very difficult circumstances." With regards new owners the talking appears to be continuing. What timescale do you have for a conclusion to these? "Unfortunately I cannot say too much due to confidentiality clauses, however I think we are in the final stages and are confident of a good outcome. We hope to be in a position to say more publicly very soon. "I thought it may well have been sorted by now but I now understand takeovers take time. Whilst it has been the fault of no one person it has dragged on longer than expected but we are now hopeful of a conclusion quite soon." What part will The Well Society (The Fans group) have in the proposed takeover? "Huge, absolutely huge. They have been a part of it from day one and have been involved in the whole process. Some say that because they have not reached the £1.5 million target its been a failure but that is not the case. Sometimes it's difficult to raise money in "non crisis situations." "I want to pay tribute to "The Well Society" and what it has managed to do for the club. The financial situation here at Motherwell has been well noted over the past few years. There are a couple of months during the winter when cash flow becomes quite tight and they have provided a real buffer zone and helped us out of a hole at times. They will form a key part of the future discussion of the club". What about major shareholder John Boyle? "It was John's vision to have this fan ownership model. His biggest consideration is to make Motherwell football club safe and secure. He needs to discuss all the options. He committed three years ago to this fan ownership, he wants to see this through. There is absolutely no doubt he has been a real custodian and has been very transparent to all involved. John's tenure at the football club is about to come to an end and no doubt he will be able to leave with his head held high." Are you looking at a similar model to Hearts' fan ownership scheme? "I could not discuss that at this time but I think everybody in Scottish football has looked at Hearts to see how they have managed to re-evaluate themselves. They are very much on the upward curve so I thinks all Scottish clubs are looking at it and saying its worth discussion." After three good seasons Motherwell have found themselves struggling for points in this campaign.